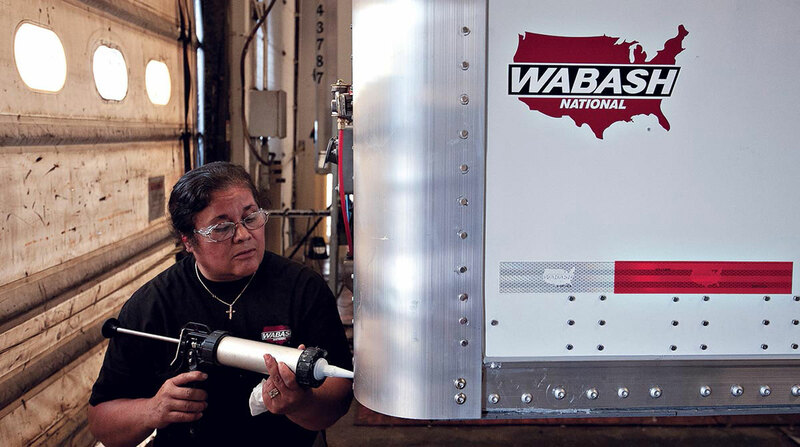 Trailer maker Wabash National Corp. reported second-quarter revenue hit an all-time high as net income jumped 39%. Net income for the period ended June 30 was $32 million, or 54 cents per diluted share. That compared with $23 million, or 36 cents, in the 2017 period. Wabash achieved record quarterly net sales of $613 million, a 41% increase compared with $436 million a year earlier. The most recent quarter’s gain is 13% higher than the previous record from the fourth quarter of 2015. Wabash acquired truck-body builder Supreme Industries Inc. in the third quarter of 2017. “Trailer and truck-body demand and orders have remained strong for the past several months, continuing the trend from the first quarter and supporting our belief in the growing secular demand in e-commerce and home delivery,” Yeagy said. At the same time, Wabash’s gross profit margin slipped to 13.9% from 15.5% in the 2017 quarter — primarily due to increased material costs, higher labor costs attributable to attracting and retaining a skilled workforce and supplier constraints for key materials leading to production inefficiencies, according to the Lafayette, Ind.-based company. “We continue to take steps to reduce the margin impact of U.S. tariff policy, raw material inflation, supply base disruptions and a very tight labor market on our business in 2018,” he added. Backlog increased $1.2 billion, or 51% higher compared with the prior year. The company updated its full-year 2018 guidance for new trailer shipments to 60,000 to 62,000 trailers and earnings to $2.06 to $2.12 per diluted share.